Today is the last day of Chanukah! Are you looking for some fresh kosher recipes this Chanukah season and all year long? Look no further than Gefen! Imagine a fresh “spin” on Chanukah that has nothing to do with dreidels and everything to do with a dinner that everyone will remember- and come back for seconds. Kayco and Kosher.com have joined forces this year to help you change it up with eight unique recipe suggestions that will be amazing all year long! Keep reading to learn more and score some fab recipes for all your kosher needs! I had the pleasure of reviewing Gefen Olive Oil that is featured in the latkes recipe below. This is an outstanding kosher certified olive oil that has a smooth taste & is the perfect addition to any of your Chanukah recipes and recipes year round. Perfect for Passover! 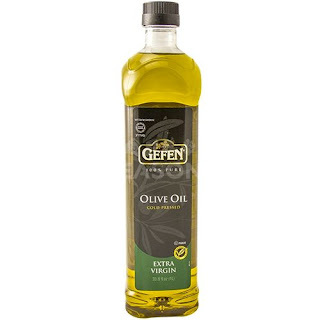 Gefen Olive Oil is rich and works great for baking, cooking, and in dressings & marinades. Be sure to check out the latke recipe below. I also had the pleasure of reviewing Gefen Apple Sauce which is featured in the Syrian Pumpkin Patties recipe below. Gefen Apple Sauce is the perfect kosher snack for the whole family. Wholesome ingredients and a fresh taste make this a winning snack any time! Also amazing in baking and great in a parfait. I like to use it in place of oil in my baking to reduce fat & calories. It bakes up lovely desserts! Kayco is the leading Kosher food distributor in America, with a variety of brands and products available at supermarkets, independent grocers, kosher food stores and natural food stores throughout the USA. Kosher.com is the premier site for kosher cooking and conversation and the place to go for all things kosher food. Less than a year old but a rising star on the kosher food scene, it has thousands of top-quality kosher recipes, articles, tips, and entertaining shows. The site is the ultimate platform for the most diverse collection of kosher recipes. This savory starter is as festive and delicious as it is pretty. Dairy-free and vegetarian, it calls for puff pastry dough and sautéed onions. With Gefen Frozen Puff Pastry Sheets and GefenFrozen Sautéed Onions, these impressive hors d’oeuvres are a cinch. If you think you’ve seen (and tasted) it all, consider this tzimmes-latke mashup starring carrots and ginger topped with a dollop of apple salsa. Cilantro and pickled jalapenos give the dish a Southwestern accent, and a bit of Gefen Honey mellows the heat. Everyone knows it’s not Chanukah without latkes. Keep it light with this easy accompaniment from Mishpacha Magazine. No need to fry these easy little cakes; just spray a muffin tin with Gefen Canola Spray and pop them in the oven. Or try this zucchini variation – same technique, same brown and crispy bites. Decadent in every way! Filled with a quartet of cheeses, porcini mushrooms, and a creamy béchamel sauce, this rich main dish is anything but ho-hum. Prep and assembly are a bit involved, though, so save yourself a step with Haddar Oven-Ready Lasagna noodles. Make Friday night extra-special – and extra-simple. The secret to Chestnut Chicken? Six ingredients and one oven roasting bag are all you need. Instead of prepping fresh chestnuts (not to mention cleaning up the shells), let Gefen do the work for you with their Roasted and Peeled Chestnuts, available in 5.2 oz. bags. Mind blown! Surprise guests with this Sephardic take on classic latkes. Bulgur wheat, pumpkin, and spices give these fritters their exotic, slightly sweet flavor, while Gefen Olive Oil gives them a perfect fry. Don’t forget the Gefen Applesauce! Olive oil is the key to a super-moist cake; lemon zest adds a fresh zip. Try Gefen Olive Oil in this easy recipe for an elegant way to end a great meal while paying homage to Chanukah. These utterly addictive delights may well replace sufganiyot as your family’s favorite Chanukah dessert. Dough is fried to a golden brown, coated with cinnamon sugar, and dipped in an amazing warm blend of chocolate (we recommend Gefen Chocolate Chips), heavy cream, and a pinch of chipotle powder.